This article is about meals referred to as "Tea". For the beverage, see tea. "Tea time" redirects here. For the Cantonese Chinese practice of "drinking tea", see Yum cha. Afternoon tea is a light meal typically eaten between 3.30 pm and 5 pm. Observance of the custom originated amongst the wealthy social classes in England in the 1840s. Her Grace Anna Maria, Duchess of Bedford, is widely credited as transforming afternoon tea in England into a late-afternoon meal whilst visiting Belvoir Castle in Leicestershire. By the end of the nineteenth century, afternoon tea developed to its current form and was observed by both the upper and middle classes. It had become ubiquitous, even in the isolated village in the fictionalised memoir Lark Rise to Candleford, where a cottager lays out what she calls a "visitor's tea" for their landlady: "the table was laid… there were the best tea things with a fat pink rose on the side of each cup; hearts of lettuce, thin bread and butter, and the crisp little cakes that had been baked in readiness that morning." Finger sandwiches: cucumber, egg, cheese, curried chicken, with shrimp canapés at tea. For the more privileged, afternoon tea was accompanied by thinly-sliced bread and butter, delicate sandwiches (customarily cucumber sandwiches or egg and cress sandwiches) and usually cakes and pastries (such as Battenberg cake, shortbread petticoat tails, or Victoria sponge). Scones (with clotted cream and jam) may also be served (as they are for cream tea). The sandwiches are usually crustless, cut into small segments, either as triangles or fingers, and pressed thin. This style of elegant and dainty tea sandwich may also be made with egg salad, tuna salad or even peanut butter and jelly. Biscuits are not usually served. Nowadays, a formal afternoon tea is more of a special occasion, taken as a treat in a hotel. The food is often served on a tiered stand; there may be no sandwiches, but bread or scones with butter and jam, or toast, muffins or crumpets. Afternoon tea as a treat may be supplemented with a glass of Champagne or a similar alcoholic drink. This is a more recent innovation. A less formal establishment is known as a teahouse or tearoom, similar to a coffeehouse. These used to be common in the UK, but these establishments have declined in popularity since the Second World War. A.B.C. tea shops and Lyons Corner Houses were successful chains of such establishments, and played a role in opening up possibilities for Victorian women. A list of significant tea houses in Britain gives more examples. The custom of taking afternoon tea with bread or pastry was also common in some continental European areas long before the emergence of the practice in England, though such customs are not widely known in English-speaking countries. For example, Alexandre-Balthazar-Laurent Grimod de La Reynière wrote in 1804 of afternoon tea in Switzerland. A tea party is a social gathering around this meal – not to be confused with the Boston Tea Party, a mid-December 1773 incident at the beginning of the American Revolution, or the 21st century political movement named after it. This snack is associated with the West Country, i.e. Cornwall, Devon, Dorset and Somerset. It usually consists of scones, clotted cream, strawberry jam, plus, of course, tea to drink. Some venues will provide butter instead of clotted cream. 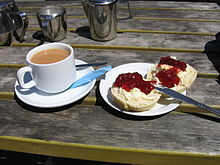 In Australia, this is commonly referred to as Devonshire Tea. High Tea is a name for the evening meal, usually associated with the working class and is typically eaten between 5 pm and 7 pm. In most of the United Kingdom (namely North of England, North and South Wales, the English Midlands, Scotland, and in some rural and working class areas of and in Northern Ireland) people in these areas traditionally call their midday meal dinner and their evening meal tea (served around 6 pm), whereas the upper social classes would call the midday meal lunch or luncheon and the evening meal (served after 7 pm) dinner (if formal) or supper (if informal). This differentiation in usage is one of the classic social markers of English (see U and non-U English). However, in most of the south of England, the midday meal is almost universally called "lunch", with "dinner" being the evening meal, regardless of social class. High tea typically consists of a hot dish, followed by cakes and bread, butter and jam. Occasionally there will be cold cuts of meat, such as ham salad. The term was first used around 1825, and "high" tea is taken on a high (dining) table; by contrast, low tea, which was more of a light snack, was served on a low table – what would be called a coffee table in North America. A stereotypical expression "You'll have had your tea" is used to parody people from Edinburgh as being rather shortcoming with hospitality. A BBC Radio 4 comedy series of this name was made by Graeme Garden and Barry Cryer. Not a meal as such, but a chance to "down tools" (or get away from the computer) and relax from work for 10–15 minutes. This may occur mid-morning (see elevenses) or mid-afternoon. It may equally involve coffee, and almost inevitably, biscuits. Once upon a time, the drinks were served by the workplace's tea lady, a position that is now almost defunct. The British and Irish habit of dunking biscuits in tea has been exported around the globe. In Australia and New Zealand, any short break for tea in the afternoon is referred to as "afternoon tea". As a result, the term "high tea" is used to describe the more formal affair that the English would call "afternoon tea". In Australia, the evening meal is still often called tea whereas the midday meal is now commonly called lunch. In rural areas, dinner is still used quite often for the midday meal, tea is at around 6 pm, and supper is either a very late meal at night, or food served at night at a social function, such as the town's annual Christmas dance and supper. In both countries, smoko can be used as a synonym for tea break, especially for people in manual jobs. Tea set, the tea pot, sugar bowl, milk jug, etc. ^ Beeton, Isabella (1898). "Tea". Mrs Beeton's Cookery Book and Household Guide (New and Greatly Enlarged ed.). London: Ward, Lock & Co., Ltd. pp. 263–264. Retrieved 13 March 2019 – via Google Books. ^ Copeman, Dawn (2006). "It's Time for Tea". Time Travel Britain. Retrieved 13 March 2019. ^ Pettigrew, Jane (2001). A Social History of Tea. London: The National Trust. pp. 102–5. ^ "It's tea time: Bring a bit of 'Downton Abbey' home". JNS. 1 February 2019. Retrieved 1 February 2019. ^ "Afternoon tea is more popular than ever as more hotels get a huge boost in business thanks to the brew". The Daily Mail. London. 6 April 2011. Retrieved 21 November 2012. ^ Mason, Laura; Brown, Catherine (1999), From Bath Chaps to Bara Brith, Totnes: Prospect Books . ^ Pettigrew, Jane (2004), Afternoon Tea, Andover: Jarrold . ^ Fitzgibbon, Theodora (1972), A Taste of England: The West Country, London: JM Dent . ^ Grimod de La Reynière, Alexandre-Balthazar-Laurent (1804). Almanach des Gourmands, Seconde Année. Paris: Maradan. Retrieved 10 October 2017. ^ English Dictionary (2nd ed. ), Oxford . ^ Bender, David A (2009). A Dictionary of Food and Nutrition (3rd ed.). Oxford University Press. ISBN 978-0-19-923487-5. An afternoon meal; may consist of a light meal (especially in southern Britain), or be a substantial meal (high tea) as in northern Britain; introduced by Anna, Duchess of Bedford, in 1840 because of the long interval between a light luncheon and dinner at 8 pm. ^ Ayto, John (2012). The Diner’s Dictionary (2nd ed.). Oxford University Press. ISBN 978-0-19-964024-9. Tea seems first to have established for itself a particular niche in the day in the 1740s, by which time it had become the fashionable breakfast drink. It was also drunk after dinner, and as the usual time for dinner progressed during the eighteenth century towards the evening a gap opened up for a late-afternoon refreshment, filled by what has since become the traditional English afternoon tea, a meal in its own right, with sandwiches and cake as well as cups of tea (amongst the earliest references to it are these by Fanny Burney in Evelina, 1778 : ‘I was relieved by a summons to tea,’ and by John Wesley in 1789: ‘At breakfast and at tea… I met all the Society’; Anna Maria Russell, Duchess of Bedford (1783–1857), famously claimed to have originated the fashion, but as can be seen, it was around well before she was in a position to have any influence over it). In various other parts of the English-speaking world, teatime has assumed other connotations: in Jamaica, for instance, it is the first meal of the day, while for Australians and New Zealanders it is a cooked evening meal—a usage reflected in the tea, and more specifically the ‘high tea’, of certain British dialects, predominantly those of the working class and of the North (the term high tea dates from the early nineteenth century). ^ Morton, Brian (26 April 2013). "On Glasgow and Edinburgh, By Robert Crawford". The Independent. Retrieved 25 January 2017. ^ "It's love in the afternoon as Australians lap up 'high' tea". The Age. Retrieved 6 January 2015. Wikimedia Commons has media related to Tea (meal). "High Times for High Tea". Weekly Times. 30 May 2013. "History of the afternoon tea tradition from China". cosmopolis.ch. China. "It's love in the afternoon as Australians lap up 'high' tea". TheAge.com. Victoria, Australia. 2013. Milton, Michelle (Foodie) (2010). "Food: High Tea". SBS. Post, Emily (1922). "Chapter XIII: Teas and Other Afternoon Parties". Etiquette.